There are few ways to make a summer afternoon more enjoyable than a cookout hosted by someone who knows how to grill brats to perfection. These tips will help you host your next cookout like a pro! Grilling brats can be deceptively difficult. Quite honestly, I think grilling as a whole is a mystery to many people, a mystery that most people attempt to subvert by cooking their protein till it is scientifically identical to lava rocks. As delicious as that all sounds, how about we talk about how to grill brats properly? There is a lot more to grilling perfect brats than simply firing up the grill and placing them over heat. A properly grilled brat is a dance between heat, charcoal placement, and brat temperature. But don’t worry, it isn’t that difficult to master. The most popular grilling method for bratwursts is the classic kettle charcoal grill. If you don’t own one, I highly recommend Weber Grills, simple to use and durable construction. Though these instructions focus on how to grill brats on this style of grill, you can use the same methods on other styles of charcoal or even propane grills. I have used many different methods to light charcoal over the years. I have used electric starters, lighter fluid, charcoal chimneys chimneys, and more. BY FAR the best way to light your charcoal is to invest in a cheap charcoal chimney. The reason why these are the best is the simple vented design ensures all of the charcoals filling the chimney are roaring hot within minutes of lighting a few pieces of crumpled paper under the base. Evenly lit charcoals equal even cooking temperatures on the grill. The other benefit to using a charcoal chimney is they typically hold the perfect amount of charcoal for a standard sized grill. Once your charcoals are fired up and ready to cook, pour them onto one side of the grill. Yes, that is correct. You do not want to spread the charcoal evenly across the floor of the grill, instead, you should lay the charcoal evenly across one-half of the grill and have the other side charcoal free. This is called zone cooking. You can achieve the same result on a propane grill by only lighting the burners on one side. This is the most important aspect of grilling perfect brats. Having zone heating gives you a high heat area and a low heat area. If your brats are cooking too fast or hot, you simply move them away from the coals. If you lay the charcoal evenly across the entire floor of the grill they have no reprieve from the heat and they will likely burn. With your zone heating set up, oil the grates (prevents sticking) and then place the brats directly over the coals. Once the brats are on the grill it is important to hang around and monitor their cooking. The first few minutes of grilling will let you know how quickly the brats will cook and how frequently they need to be rotated. Once the brats are taking on color, you will want to give them a quarter turn. Keep turning until each side of the brat has a rich reddish-brown color. If the exterior gets done before the brats finish cooking simply move them to the opposite side of the grill away from the coals so they can finish cooking without burning. How long to cook brats will depend on how hot your coals are, and how many you are using. However, typically grilling brats for 15-20 minutes is ideal. You will know the brats are done when an instant-read thermometer shows 160 degrees. 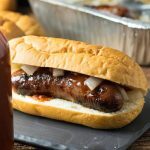 Should You Boil Brats Before Grilling? Boiling brats before grilling is a crutch used by people afraid to serve undercooked brats. This allows them to precook the brats and then simply brown them on the grill. Others boil the brats in beer to add flavor. However, the problem with this is the intense temperature of the boiling opens the ends of the casings and renders out a lot of delicious juice from the brats, resulting in a drier, less flavorful, bratwurst. There is a solution, however. Rather than boiling the brats, use a Beer Brat Bath instead, otherwise known as a Beer Hot Tub. This serves two functions. Most importantly, it keeps the brats warm after grilling so people can come grab one whenever they are hungry, and secondly, it infuses the brat with the flavor of beer, like boiling does, except it is done and a more manageable temperature. If your brat bath is kept around 160 degrees the brats will be piping hot, without drying out and over-cooking. 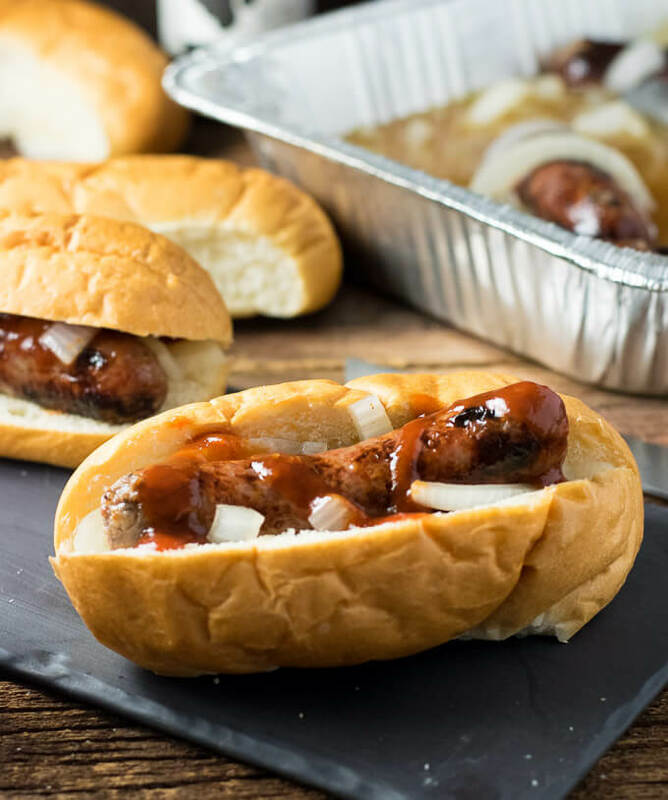 Brats should be served on a bun slightly larger, and more hearty, than a traditional hot dog bun. Some purists will claim a brat should simply be topped with mustard, but even in Wisconsin, very few people adhere to that. In my opinion, no brat tastes better than when dressed with my personal Brat Sauce recipe. Top that with some beer soaked onions, and homemade sauerkraut and you have yourself the perfect brat! Light charcoal and spread it evenly across one-half of the grill. If using propane, light burners only on one side of the grill. Place brats on grates directly over charcoal and grill on each side until browned. If the casing bursts or burns move brats further from the coals to reduce cooking temperature. Cook brats for 15-20 minutes, or until internal temperature reaches 160 degrees. Cooked brats are firm to the touch. Keep brats warm in a Brat Bath until ready to serve. 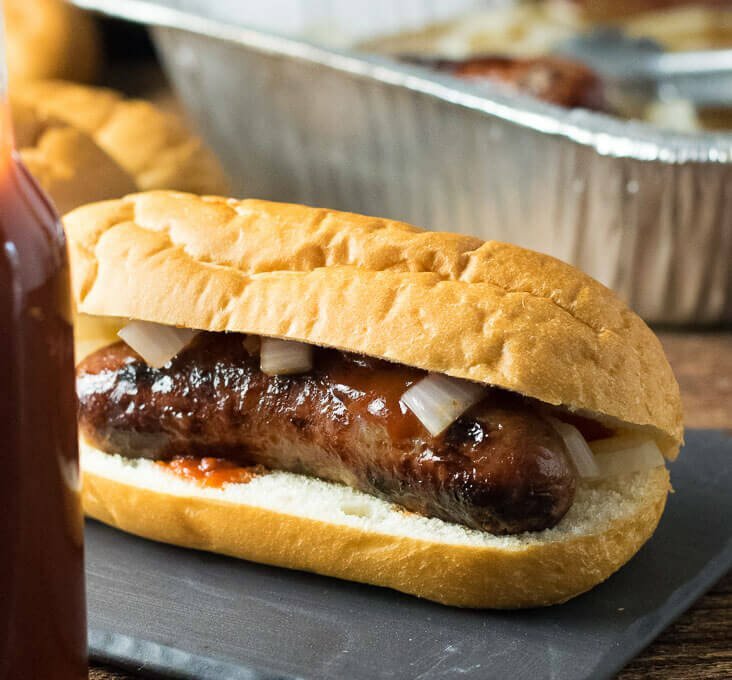 Serve on buns with onions, sauerkraut, and brat sauce. 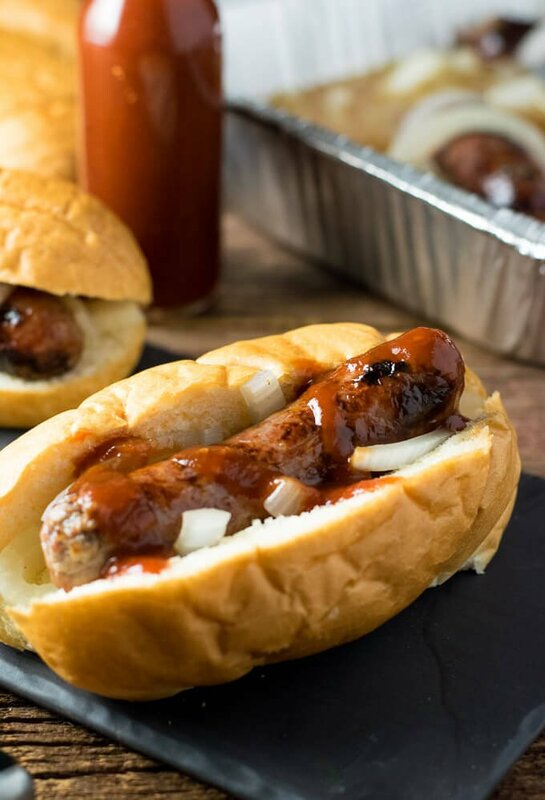 You will want to keep your brats warm in this Beer Brat Bath. 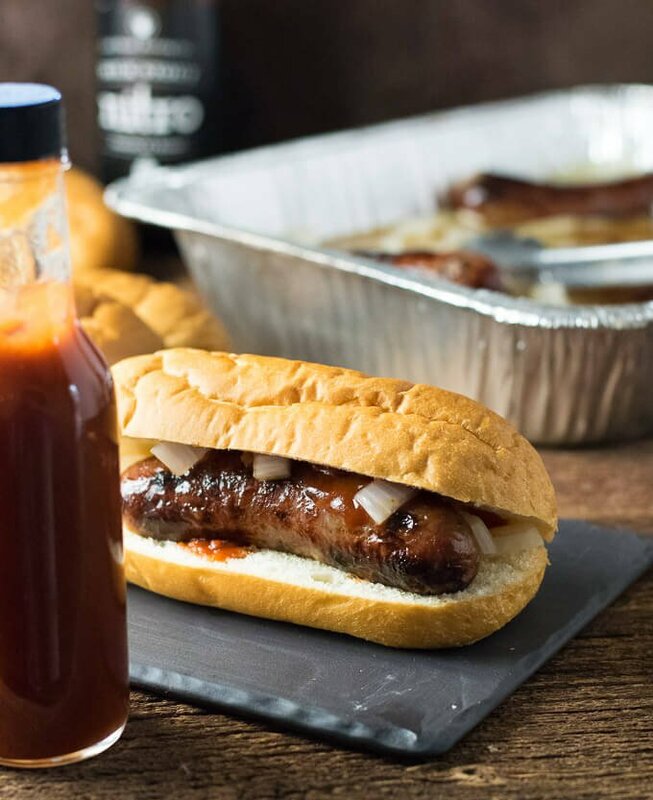 Make sure you make a batch of my Brat Sauce to serve as the perfect condiment for your brats! If you enjoyed reading How to Grill Brats to Perfection then you should probably like me on Facebook and follow me on Pinterest too. That’s what I would do at least, because if you don’t get to know me but you still use my recipe it is kind of like taking candy from a stranger, and your mom taught you not to do that. Don’t disobey your mom, subscribe to Fox Valley Foodie today. My brats turned out better than ever. Thanks! My husband is from Wisconsin. Tomorrow is his birthday. I’m going to try cooking brats for the first time. I’m using your recipes and method. Will let you know how it goes. I’m counting on you for his birthday surprise!